Not everyone has the time and budget to gut their bathrooms and replace everything. So instead of feeling ashamed of your vintage space, why not embrace the look and create a room that's teeming with nostalgia and memories? Got an old-school bath tub? Polish those clawfeet and use it as the centerpiece in a space with a retro feel as opposed to spending hundreds to thousands of dollars replacing it. 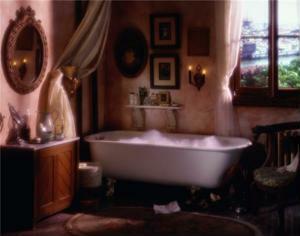 Rely on the fixture as the jumping off point, picking up on the curved lines of the tub and the detailing of the feet. Does your bathroom vanity look like an antique even though it's really not? Well, you might as well embrace it and distress it more with some chains and a metal brush for that centuries-old European feel. To complete the retro vibe, choose bathroom accessories that will complement the aesthetic. Why not hang wooden frames filled with pictures of friends, families, or even random landscapes to create some interest on the walls? With just a few simple actions, you can easily turn a simple room into a relaxing sanctuary.